An easier way to understand airbrushes. Iwata airbrushes and Anest Iwata spray guns are designed and manufactured with the utmost precision and quality. That is why, with over 90 years of expertise, the Iwata brand is trusted by industry leading artists around the world. 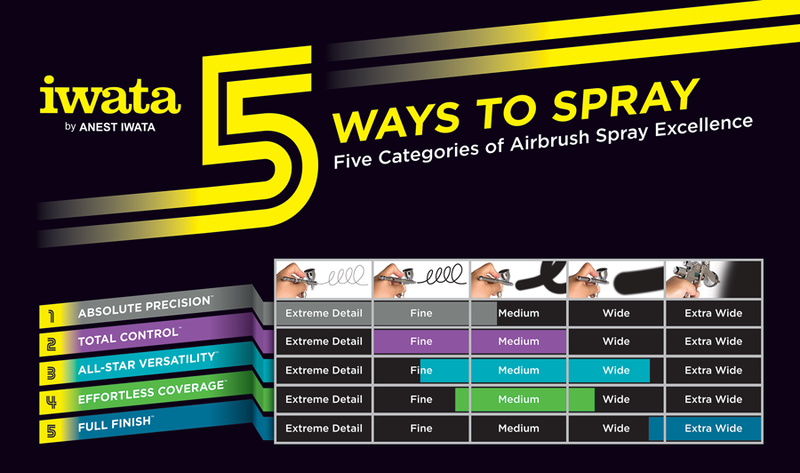 From extreme detail spraying to maximum coverage, we classify our airbrushes into five categories so you can easily find the perfect Iwata airbrushes to cover your specific needs for any project. Experienced airbrush users who demand absolute precision choose Iwata Custom Micron Series airbrushes for extreme detail spraying. What makes Custom Micron special is that every Custom Micron Head System is custom matched and hand-tuned to meet Iwata's rigorous performance standards for superior atomization. Custom Micron is a one-of-a-kind airbrush experience with superb handling for extreme detail. 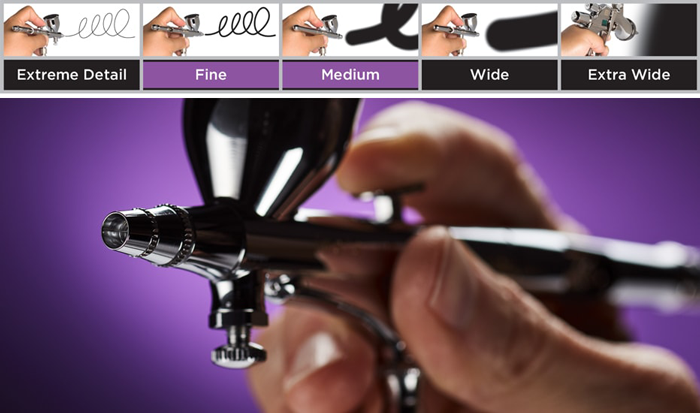 The unique feature of the hand-matched head system means all of the parts in the head are assembled, tested and adjusted until the spray characteristics are as perfect as an airbrush can be. Available as a set, the head systems can be interchanged for maximum reliability and ultimate performance. Spare head systems can be purchased to ensure the Custom Micron will always spray to its fullest potential. 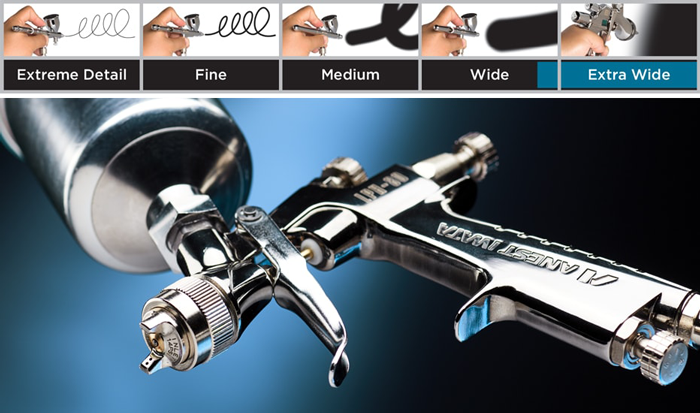 Click here to view the Custom Micron airbrushes. Offering total control for fine detail to medium spraying, Iwata's Hi-Line Series and High Performance Plus Series airbrushes are designed around the legendary Iwata HP Series which established the Iwata name in the creative community over 50 years ago. Hi-Line Series airbrushes feature a Micro Air Control (MAC) Valve that enables incremental control of the airflow. Using the MAC Valve, you can easily restrict the airflow to create stipple effects. Designed for artists who need total control of detailed spraying, the Hi-Line Series uses larger diameter threads on the nozzle than the old High Performance Series. This makes the nozzle much stronger when tightening it onto the airbrush and ensures better centering of the nozzle when it screws onto the airbrush body. The Hi-Line Series is made with PTFE solvent-proof needle packing, a dual-purpose cutaway pre-set handle and one-piece auxiliary lever/needle chucking guide. A breakthrough technology, the Micro Air Control (MAC) Valve enables infinite control of the airflow at the head of the airbrush, which is different than just regulating the air pressure at the compressor. Each nozzle is precisely made on the industry's most sophisticated machinery. They are hand tested to assure accurate control and fine atomization of the spray, and they are self-sealing, which eliminates the need for messy sealers. Unlike conventional brass nozzles, steel alloys are more durable and resist damage from harsh chemicals. 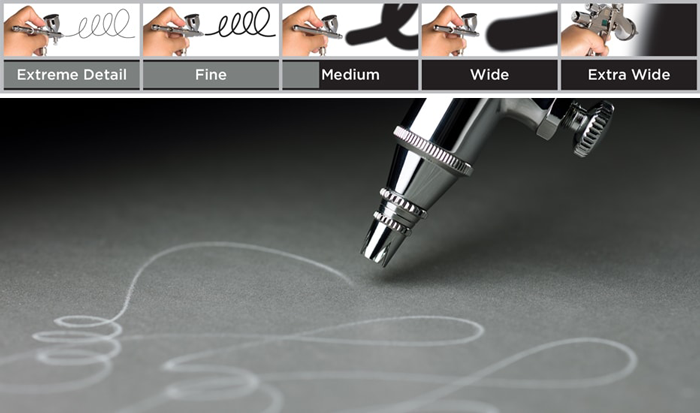 Click here to view the Hi-Line airbrushes. Renowned as the professional's workhorse, the Iwata High Performance Plus Series has been fulfilling the needs of those requiring outstanding control, superior atomisation, and fine consistent detail through to medium sized areas. The HP Series has proved itself with illustrators through to customisers with its versatility and durabilty. Click here to view the High Performance Plus airbrushes. The unique multi-purpose, high flow Iwata Eclipse Series airbrushes are designed to easily atomise heavier sprayable mediums from a controlled fine line to controlled wide spray. This makes Eclipse Series highly versatile and suited to almost any project. Eclipse's compression-fit nozzle is easy to clean and assemble. Hugely popular, Eclipse Series is the ultimate in all-star versatility. The drop in hardened stainless steel nozzles are self centring for perfect alignment and quick and easy assembly. These nozzles afford high paint flow with ultimate control. With interchangeable heads, 0.35 or 0.5mm this makes the Eclipse a truly versatile airbrush, from fine to broad coverage. The Eclipse Series have PTFE solvent-proof needle packing. Click here to view the Eclipse airbrushes. Iwata Revolution Series and Neo for Iwata Series airbrushes deliver soft, effortless coverage and quality atomisation at low air pressures. Fine atomisation is achieved using the smallest air compressors, making these airbrushes a simple choice for medium spray applications and for anyone wanting to start airbrushing for the first time. Revolution airbrushes feature its popular comfort-handle, while Neo airbrushes offer popular models at value prices. Iwata Revolution airbrushes deliver soft, effortless coverage and quality atomisation at low air pressures making them a great choice for general purpose spraying. The spray quality is superb for an airbrush of this price range. Iwata's spring-steel needle resists breakage and the easily replaceable PTFE needle packing are solvent resistant for longevity. Each nozzle is precisely made on the industry's most sophisticated machinery. They are hand tested to assure accurate control and fine atomisation of the spray, and they are self-sealing, which eliminates the need for messy sealers. Unlike conventional brass nozzles, steel alloys are more durable and resist damage from harsh chemicals. Click here to view the Revolution airbrushes. Neo for Iwata Series airbrushes are designed to deliver soft, effortless coverage at low air pressures, making them an easy choice for many types of spray applications. Fine atomisation is achieved with the smallest air compressors, making Neo an affordable option for general purpose spraying and for anyone wanting to airbrush for the first time. 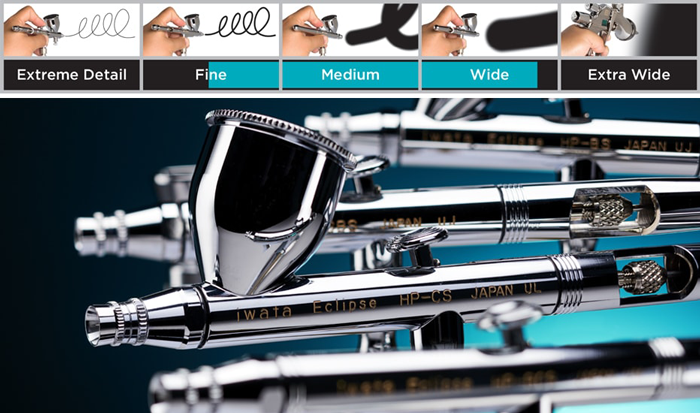 Click here to view the Neo for Iwata airbrushes. Category 5: Full Finish. When airbrush projects call for larger coverage, Iwata G-Series Airbrush-Guns and Anest Iwata Spray Guns offer a full range of models. G-Series sprays with the fine atomisation and air pressure of an airbrush. For maximum coverage and full finishes, Anest Iwata spray guns offer superior atomisation for a reliable and consistent finish. View the Iwata G-Series Airbrush-Guns and Anest Iwata Spray Guns. All Iwata airbrushes are internal-mix, which gives finer and more even atomisation than external mix airbrushes. So we have not displayed a column for the internal-mix feature. Click on the product codes above to view the product page. Click on blue high-lighted key words for explanation in glossary of terms. * This is a guide only. Please call for advice on suitability for your individual requirements. All Iwata airbrushes and 'Neo for Iwata' airbrushes are warranted by Anest Iwata-Medea against all manufacturing defects of materials and manufacture or workmanship for a period of 5 years from the date of purchase. This warranty does not cover needles, nozzles, packing and o-rings, since these parts need to be replaced occasionally due to normal wear. Any other part or material that is or becomes defective so as not to be usable within this period will be repaired or replaced. This warranty does not cover damage caused by negligence or airbrushes that have been altered or abused in any way. It also does not cover cleaning or servicing. Anest Iwata-Medea Plc. and The Airbrush Company Ltd. warrant to the original purchaser that they will repair or replace, at their option, without charge, any part of the Iwata airbrush, excluding fluid nozzles, fluid needles, packing and o-rings, found to be defective in factory material or workmanship within five years from the date of original purchase. Warranty service will be provided only at Anest Iwata-Medea authorised service centres (The Airbrush Company Ltd in the UK). You must pay all charges for shipping and transporting your Iwata airbrush to and from these service facilities. Any material that is shipped to Medea or their service centre without prior authorisation may not be accepted. Subjected to negligence or misuse. Operated or maintained contrary to our instructions. Damaged by fire or any other occurrence beyond our control. Damaged in transit to the service centre due to inadequate packaging. Fitted with spare parts that are not genuine Iwata parts. Anest Iwata-Medea will not be responsible for damage to persons or property, commercial loss or any other incidental or consequential damage caused by a defective airbrush. However, some states do not allow the exclusion or limitation of incidental or consequential damages, so the above limitations may not apply to you. All implied warranties, including any warranty of merchantability or fitness are limited to the duration of this written warranty. However, some states do not allow limitations on how long an implied warranty lasts, so the above limitation may not apply to you. Your 5 year Anest Iwata-Medea warranty is only valid in the UK if you have purchased your airbrush from an authorised UK reseller and you have proof of purchase. On Iwata airbrushes, but excluding 'Neo for Iwata' airbrushes, the above warranty is extended by the Airbrush Co Ltd to 10 years in the UK. Your UK warranty is with The Airbrush Company Ltd, the UK distributor for Iwata airbrushes and compressors. Your extended 10 year Airbrush Company warranty is only valid in the UK if you have purchased your airbrush from an authorised UK reseller and you have proof of purchase. If your new Iwata airbrush does not come with a UK warranty notice, then it is likely that the dealer you purchased it from is selling 'grey imports' and the official Iwata warranty will only be valid in the country that the dealer imported it from. Please contact the Airbrush Company to determine if the company you are purchasing from, or have purchased your Iwata airbrush from, is an authorised UK reseller. If you have purchased your Iwata airbrush from a dealer in another country, your warranty will be valid in that country and you will need to return it to the vendor for repair or replacement under warranty. Technical assistance and support is available on our telephone help-line. The UK warranty on Iwata Studio Series compressors, whether bought separately or at the same time as an Iwata airbrush as system or kit, is the standard one year warranty. Please refer to the Iwata compressor warranty below. Anest Iwata-Medea Plc. and The Airbrush Company Ltd. warrant to the original purchaser that they will repair or replace, at their option, without charge, any part of the Iwata Studio Series Compressor found to be defective in factory material or workmanship within one year from the date of original purchase. Warranty service will be provided only at Anest Iwata-Medea authorised service centres (The Airbrush Company Ltd in the UK). You must pay all charges for shipping and transporting your Iwata compressor to and from these service facilities. Any material that is shipped to Medea or their service centre without prior authorisation may not be accepted. Damaged by fire, corrosion, moisture or any other occurrence beyond our control. Altered or fitted with parts incorrectly by you or any party other than an Anest Iwata-Medea authorised service centre. Used with the wrong voltage/frequency power supply or with a power supply converter. Anest Iwata-Medea will not be responsible for damage to persons or property, commercial loss or any other incidental or consequential damage caused by a defective compressor. However, some states do not allow the exclusion or limitation of incidental or consequential damages, so the above limitations may not apply to you. Please contact the Airbrush Company before returning an airbrush or compressor for the appropriate procedure for warranty repairs. Click here for a guide to choosing your airbrush. Click here to learn about the 5 hazards to avoid when purchasing your airbrush. 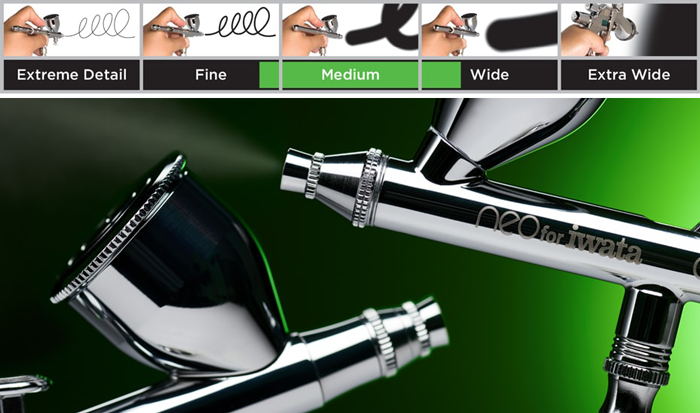 Click here to view our airbrush product pages. Click here to for more information about Iwata compressors. Click here for a guide to choosing your air source to supply air to your airbrush. Click here for our airbrush and compressor kits for all applications. Click here to contact us for advice.